The progressive and socialist counter-revolution against classical liberalism, free markets, and individual liberty is intensely at work, especially in academia and other intellectual groups determined to oppose the ideals of the free society. Quinn Slobadian’s new book, “Globalists: The End of Empire and the Birth of Neoliberalism” (2018) is one of the latest of these attacks, and does so through distortion, misquoting and twisted representation of what classical liberals such as Ludwig von Mises Mises and Friedrich A. Hayek said and advocated. “Neoliberalism” is the conceptual bottle into which Slobadian pours all his dislike for individual freedom, free trade and limited government. And unrestrained majoritarian “democracy” becomes the “holy grail” promising all the good things of a progressive agenda of government planning, regulation and income redistribution. But to make his case Slobadian twists the words, arguments and policy views of Mises and Hayek (and other classical liberal thinkers) to make them seem apologists for exploitation, dictatorship and opponents of diversity and justice. I detail where and how Slobadian has misquoted, falsely summarized, or outright misstated the case for liberty, free trade and limited government as actually found in the works by Mises and Hayek to which he refers. The case for liberty is also, now, a battle for truth against those who would fabricate history to make the case for the collectivist future for which they crave. free markets and limited government. 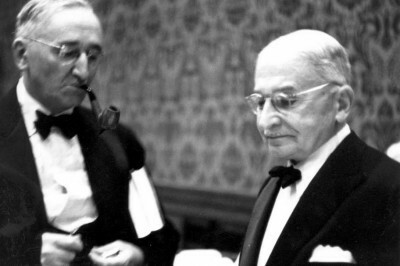 Prominent voices for the free society in the 20th century, like the Austrian economists, Ludwig von Mises and Friedrich A. Hayek, are among the targets that opponents of free market liberalism are taking aim. In doing so, the anti-liberals distort the facts and twist the historical record. It is necessary to clarify those facts and set the record straight. Another instance of such a distortion of the facts is Professor Slobodian's discussion of Mises’s proposal for a political and economic federation among the countries of Eastern Europe in the post-World War II era as a bulwark against nationalistic wars among the member nations and a unified force against any threats in the future by either Germany or Soviet Russia. ------------------------ (2010). Political Economy, Public Policy and Monetary Economics: Ludwig von Mises and the Austrian Tradition. London/New York: Routledge. ------------------------ ([1939b). “Freedom and the Economic System” in Bruce Caldwell, ed., The Collected Works of F. A. Hayek, vol. 10: Socialism and War: Essays, Documents, and Reviews. Chicago: University of Chicago Press, 1997. ----------------------- (1944). The Road to Serfdom: The Definitive Edition in Bruce Caldwell, ed., The Collected Works of F. A. Hayek, vol. 2. Chicago: University of Chicago Press, 2007. --------------------------( 2009). Memoirs. Auburn, AL: Ludwig von Mises Institute. ------------------------ ([1941a] 2000). “Postwar Reconstruction” in Richard M. Ebeling, ed., Selected Writings of Ludwig von Mises, Vol. 3: The Political Economy of International Reform and Reconstruction. Indianapolis, IN: Liberty Fund. ------------------------ ([1941b] 2000). “An Eastern Democratic Union: A Proposal for the Establishment of a Durable Peace in Eastern Europe, in Richard M. Ebeling, ed., Selected Writings of Ludwig von Mises, Vol. 3: The Political Economy of International Reform and Reconstruction. Indianapolis, IN: Liberty Fund. ----------------------- (1966). Human Action: A Treatise on Economics, 3rd revised ed. Chicago: Henry Regnary. The above originally appeared at the American Institute for Economic Research. I've been saying for almost a decade that no one but those of us who already understand Austrian School analysis and concepts have the slightest familiarity, much less an understanding, of that analysis and/or those concepts. It means that all of our critics lie about us every time they say anything about us. Don't act surprised. Note that this podcast has not been banned from iTunes. Slobo saw this as a nice career move after seeing Pickety's BS. I read or heard somewhere (possibly incorrectly) that not many got past page 20 of the Kindle edition of Pickety. I hope the same for Slobo's book.